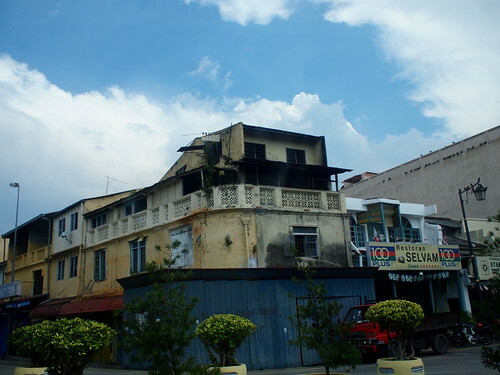 I went to Singapore the other day and thought it will be good to stop in Melaka for a night. 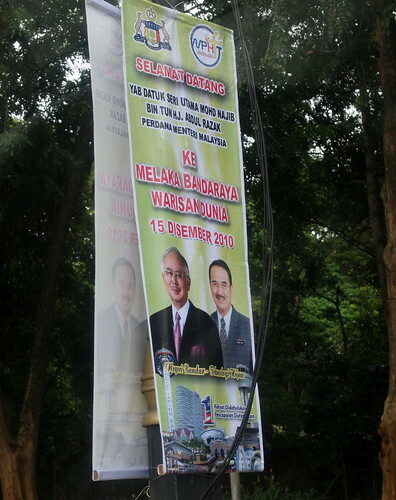 Our last trip to Melaka was several years ago, i.e. to attend my niece’s wedding at Hotel Puri. If I remember correctly, Melaka and Penang haven’t obtain the Unesco Heritage Site then. 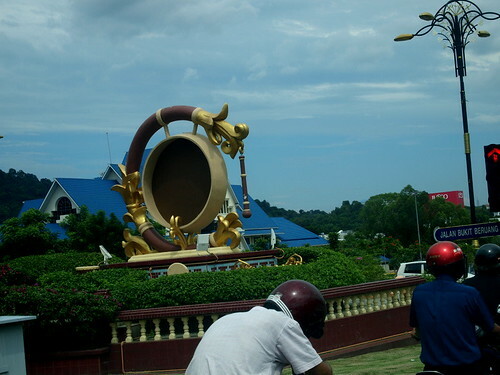 So, with much anticipation, we stopped at Melaka for a night. We arrived from Singapore around 4 pm and just in time to be the first customer at Ban Lee Xiang satay celup. We wanted to stay in Melaka town and found a family room at one of the bigger hotels in town. It is one of those ‘made for Government servants seminar’ hotels and the place is rather crowded. At night, we went to Jonker Walk and that’s where I get the idea to call it Melaka Darul Mamee. The whole town is plastered with huge, ugly, crude, arches with the PM, CM and Mamee cup noodle. The irony is the design is such that the head of the PM and CM are smaller than the Mamee cup, hence, you can actually imagine putting the heads into the cup mee. Maybe I am rather biased as I am from Penang, another Unesco World Heritage site but really, Melaka is nothing like Penang. It has this little quaint Jonker Walk but that’s about it. In Jonker Walk, the foods are like a repetitive cycle of maltose (bah leh kor), hurricane potato, pineapple tarts, bubble tea, cendol, maltose (bah leh kor), hurricane potato, pineapple tarts, bubble tea, cendol, maltose (bah leh kor), hurricane potato, pineapple tarts, bubble tea, cendol,maltose (bah leh kor), hurricane potato, pineapple tarts, bubble tea, cendol,maltose (bah leh kor), hurricane potato, pineapple tarts, bubble tea, cendol… (ok, you get a gist of what I am trying to say). As for the buildings, they are too corny and overdone, IMHO. Of course, there are some really beautiful structures but overall, I find Jonker Walk rather forlon and sad if we take away the pasar malam. 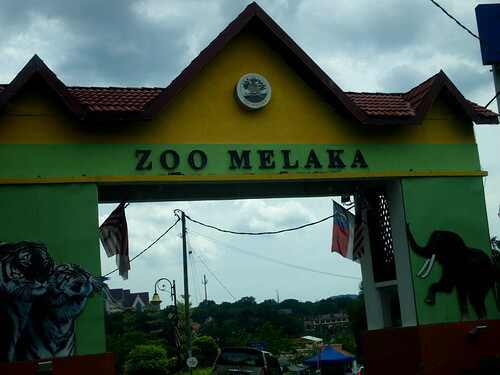 One of the reasons we stopped in Melaka (instead of KL) was to go to the Melaka Zoo. I remembered it was much better managed many, many years ago. This time, my little boy complained the moment he got inside. So smelly, so dirty and they do not even run the tram regularly. So, if you have to pick either Penang or Melaka, come to Penang. At least we know that you won’t be seeing the face of the CM every 100 m as you travel along their roads. 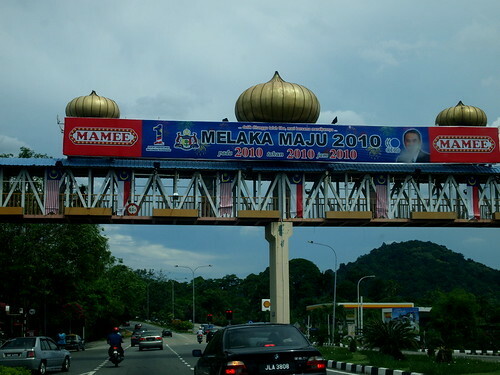 You know they have spent a lot of money into this state because there are many large (but useless) structures of overblown size kompang, fruits and such. Those things stick out like a sorethumb in a state which is supposed to be heritage. I said Melaka is like a fun pasar malam. Someone else said, it is like a mini disneyland. Either way, it is too corny, gaudy and you get tired of the place after 24 hours.